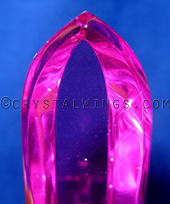 They may be used as Altar Pieces, and also held in the hand as a healing wand. The Flame of Saint Germain shape symbolizes the eternal flame that burns in our hearts; it is the awakening flame of energetic immortality. Towering at the tip are wisdom, guidance, and strength to assist in the release and transmutation of those inner and outer structures that no longer serve us. Notice the naturally occuring flames in the tips. These photos are not retouched. 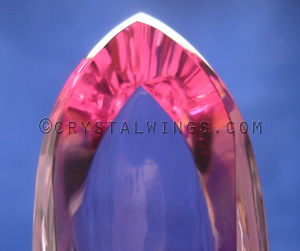 Sizing: 4-1/2" X 1-1/8" X 3/4"
Each wand has slight variation in size and polish. Some are more narrow, others wider. Order this print from www.Ascension-SaintGermain.com Saint Germain made a name for himself as an alchemist during the seventeenth and eighteenth centuries in Europe. He was famous for his mastery in using alchemy he had learned from adepts in the Himalayas that gave him the power to transmute negativity within the body, and even shapeshift objects in the material world. During the eighteenth century Comte de Saint-Germain's name was recognized throughout Europe. He was intimate with those in high places, such as King Louis XV and his mistress, Madame Pompadour. In their diaries, letters and in news reports it is written that Saint Germain retained his youthful appearance spanning over many decades, he had precious knowledge of chemistry and natural sciences, abilities in the arts of the adepts, and possessed powerful keys to universal medicine and miracles. 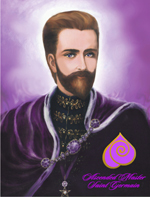 For this reason Saint Germain is viewed by many as an Ascended Master, a highly evolved individual who has mastered his emotions and mind to a point where he no longer lives at the same level we do. He is believed to be a companion, a friend, and a teacher to those who are on the path of health, healing, and transmutation.